Jennie's (used to be) fishing life! Just life that hopefully includes fishing! This is a journal of my life. I used to keep it to myself, but then there was ifish! Each month that I tick off as written, I think to myself, "I've made it another month of life!" Since breast cancer, aortic dissections and retinal detachments, and just "marfan syndrome" this means even more! I love my life, and it's a pleasure to fish it. I beat breast cancer! I hope! Jan.| Feb. | March | April | May | June | July | Aug. | Sept. | Oct. | Nov. | Dec.
Jan | Feb. | March | April | May | June | July | Aug. | Sept. | Oct. | Nov. | Dec.
Jan | Feb | March | April | May | June | July | Aug. | Sept. | Oct. | Nov. | Dec. In 2010, I was diagnosed with breast cancer. 2015 I'm going to live forever! 2006 notes---I am so thankful that, YES! I get to add another year! YAY! That last one was a close one! 2007 notes- It means so much more to me, every time I graduate a year. We should all think this way! 2007 YAY! Every time I'm able to add another month, I'm just tickled pink! 2008 notes??? Oh, my gosh! I can't believe it! It thrills me to no end to tick off each month, but to start a new whole year really excites me! Praise God! 2009 Notes- I'm just tickled to be here, still! 2008 was a tough year on so many of us! But, being here and having it be tough, well? It's better than the alternative! 2010 notes- No way! Still? 2011... I was diagnosed with breast cancer, and I can't believe I'm still chugging on! Life is so good, as long as it is! Forget about the idea of me telling all about myself here. This network is about fishing, and I love to fish! That's it in a nutshell, or a fish net, or whatever! I fish whenever I can, thus the name, and lately that is not often enough! 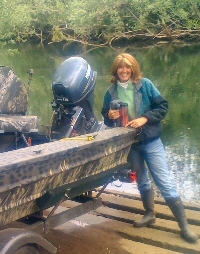 Feel free to browse my writings about my fishing adventures. Sometimes I wish I were more scientific about my writings, so that I could go back and look at weather conditions, and water temps, but for right now, it is just my thoughts on a day to day basis, whether I'v fished or not. Often times, I will write about my memories of fishing when I can't be out there. 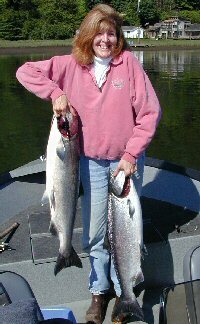 I have found that writing about my fishing adventures is very therapeutic for me, and kind of fun to look back at. I hope you enjoy reading it, and find it somewhat useful if you are driving down to the coast to fish. 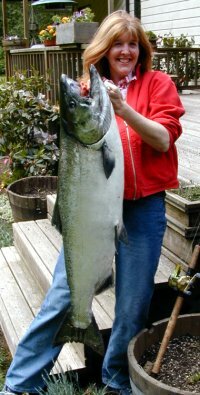 You can check river levels, and how my fishing was the day before, during steelhead season. It seems I can never read too much about fishing, and I hope this is worthwhile for you. It sure is for me!